In the latest Reformation Commentary on Scripture, we watch as the diverse streams of the Protestant movement converge on the book of Acts. As we return with the Reformers to this vision of Spirit-filled community, we are given a lesson in the nature of biblical reform from those who bore it out for the first time. Authors Esther Chung-Kim and Todd R. Hains present a vivid portrait of the Reformers' views on the contemporary church's faithfulness to its God-given identity and calling. The Reformers approached the narrative account of the early church in the book of Acts from diverse viewpoints. Commentators like John Calvin and the Swiss Reformed Heinrich Bullinger elaborated on the theological implications of the text with a great deal of historical detail. Others like reform-minded Catholic Johann Eck evoked episodes in Acts in response to pressing concerns of the day. Sermons upheld notable characters in Acts such as Peter, Stephen, Paul, Lydia and Apollos as examples of robust faith and of life in Christian community. Anabaptists in their apologetic works focused heavily on the necessity of believer's baptism. The commentators' interactions range from irate disagreement to irenic concord, but all exhort their readers not to dissolve "the holy knot" of the plain history of Christ's works and their lasting fruits. For them, Acts is certainly history, but it cannot be mere history. The Reformation was a call to return with renewed vigor to the biblical roots of Christian faith and practice. Still, for the Reformers, the truth of the Bible could never be separated from the true community of God's people gathered by his Word. In the book of Acts, they found God's blueprint for how the church should participate with the Holy Spirit in accomplishing his purposes in the world. In the latest Reformation Commentary on Scripture, we watch as the diverse streams of the Protestant movement converge on the book of Acts. As we return with the Reformers to this vision of Spirit-filled community, we are given a lesson in the nature of biblical reform from those who bore it out for the first time. Authors Esther Chung-Kim and Todd R. Hains present a vivid portrait of the Reformers views on the contemporary churchs faithfulness to its God-given identity and calling. 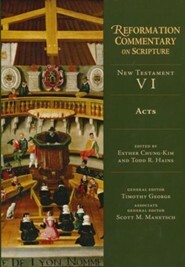 The Reformers approached the narrative account of the early church in the book of Acts from diverse viewpoints. Commentators like John Calvin and the Swiss Reformed Heinrich Bullinger elaborated on the theological implications of the text with a great deal of historical detail. Others like reform-minded Catholic Johann Eck evoked episodes in Acts in response to pressing concerns of the day. Sermons upheld notable characters in Acts such as Peter, Stephen, Paul, Lydia and Apollos as examples of robust faith and of life in Christian community. Anabaptists in their apologetic works focused heavily on the necessity of believer's baptism. The commentators' interactions range from irate disagreement to irenic concord, but all exhort their readers not to dissolve "the holy knot" of the plain history of Christ's works and their lasting fruits. For them, Acts is certainly history, but it cannot be mere history. Esther Chung-Kim (Ph.D., Duke U.) is assistant professor of religious studies at Claremont McKenna College, Claremont, California. She is the author of . Todd R. Hains is an academic editor for Lexham Press and a PhD candidate in historical theology at Trinity Evangelical Divinity School in Deerfield, Illinois. He previously served as assistant project editor of the Reformation Commentary on Scripture. I'm the author/artist and I want to review Acts - eBook.